STATES have put a spanner in the Centre’s move to regulate industrialisation around national parks and wildlife sanctuaries by notifying eco-sensitive zones. Worried about how the process would hit development and apparently under pressure from mining and industry lobbies, the states have excluded several ecologically important areas around wildlife parks and sanctuaries from being protected. To make matters worse, the communities around eco-sensitive areas are also in uproar because they have been excluded from the process of identifying and governing the eco-sensitive zones (ESZs). On December 31, 2012, the Ministry of Environment and Forests had issued an order giving February 14 as the deadline to states to send proposals for declaring site-specific ESZs around protected areas (national parks and wildlife sanctuaries). The ministry said if the proposals were not sent for a particular national park or sanctuary by the deadline, restrictions on industrial development will be imposed within 10 kilometres around that protected areas (PA). ESZs are ecologically important areas notified under the Environment Protection Act to be protected from industrial pollution and unregulated development. Of the total 102 national parks and 526 wildlife sanctuaries in the country, so far, only seven have ESZs around them. The Centre extended its deadline till June 15 after receiving proposals from only a handful of states. Till June 30, the environment ministry received proposals of only 361 PAs out of 621 PAs. While 105 PAs in Andaman and Nicobar have been exempted from this process, several states sent the proposals after the deadline. The Centre now plans to notify ESZs on the basis of the proposals, but the arbitrary manner in which ESZs have been identified might defeat the very purpose of notifying them. Documents on internal communications between various state departments show that despite forest departments identifying ESZs in time, state governments delayed the submission of the proposals to tweak them to please the mining and industry lobbies. As a result, the state proposals exclude several ecologically important areas where mining and industrial works are happening or can take place in the future. Ministry of Environment and Forests’ guidelines, issued in February 2011, say that a field-level committee will identify ESZs within 10 kilometres of the PA boundary. The committee will comprise field staff of the forest, revenue and Panchayati Raj departments and an ecologist. The chief wildlife warden of the state, after scrutinising the committee proposals, will send them to the environment ministry. In Odisha, the forest department had prepared the proposal by February. The state government then conducted meetings with the mining, industry and revenue departments and tweaked the proposal. In a meeting held on May 21, Odisha Chief Minister Naveen Patnaik, on the recommendation of the state revenue minister, asked the forest department to reduce the extent of an ESZ at Kuldiha Wildlife Sanctuary in Balasore district to exclude stone quarries and crushers operating in the area. It was decided in the meeting that “the eco-sensitive zone boundary will be about five kilometres in the south-western direction so that 80-90 per cent of the quarries are kept outside the ambit of ESZ regulations. Likewise, in the north-eastern side, the ESZ limit will be delineated in a way that quarries in Mitrapur area are not adversely affected”. The chief minister decided to exclude the quarries despite the chief wildlife warden of the state arguing that the area included in the proposed ESZ was the frequent migratory route for elephants, and quarries could not be legally allowed adjacent to the boundary of the sanctuary. The chief minister also gave instructions to expedite the disposal of pending quarrying proposals. 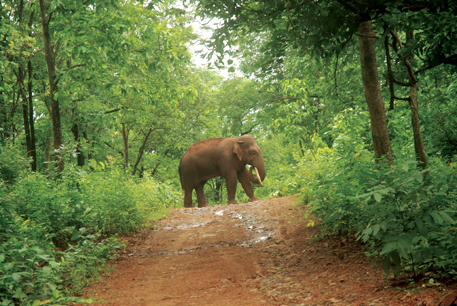 In another case, the proposal for Karlapat Wildlife Sanctuary in Kalahandi was revised to limit the ESZ extent to one kilometre on one side of the sanctuary because of the presence of bauxite deposits. Mining company Vedanta is reported to have plans to mine bauxite from this region for its refinery in Lanjhigarh. At the Chandaka-Dampada Sanctuary too, the steel and mines departments forced the forest department to reduce the extent of ESZ from five kilometres to 500 metres on the western side of the sanctuary because “some of the best quality fire clay mines” are present there. In the case of Kapilas Wildlife Sanctuary in Dhenkanal, the extent of ESZ was reduced from 10 kilometres to 500 metres. J D Sharma, chief wildlife warden of Odisha, admits high stakes in the land around PAs in the state has complicated the process. “Northern Odisha has the maximum PAs. It also has maximum mineral reserves. The mining industry, township developers and transporters fear that if ESZs are notified, their projects may shut down in these regions. Several committees were formed right from the district level to the state Cabinet level to scrutinise the proposals. This took time,” he says. Biswajit Mohanty of the non-profit Wildlife Society of Orissa thinks the state government, under pressure from the mining and industry lobbies, sabotaged the process of identifying ESZs. “Ecological integrity of the PAs and wildlife presence have to be the most important criteria for identifying ESZs. Most of the original proposals of the forest department were based on these criteria. But the state government altered the proposals to exploit these areas,” he says. The presence of minerals and resources near PAs has disrupted the identification of ESZs in other states too. Sources in the Uttarakhand forest department say about 27,000 hectares of land was deleted by the state government from the original ESZ proposal of the Kedarnath Wildlife Sanctuary to accommodate hydel projects. The deleted area has rivulets that make the watershed system of the sanctuary. “Sand mining and hydel projects are very close to the PA boundaries. The pressure from above to exclude these areas was so much that the local staff had no clue on how to make the proposals. Many of the proposals were made by copying others,” says a forest official posted in Dehradun. In Jharkhand, the notification of ESZ around Dalma Wildlife Sanctuary issued in March 2012 had irked TATA Steel Limited. While the environment ministry capped the extent of ESZs to five kilometres from the boundary of the sanctuary, TATA wanted it to be limited to one kilometre. The company argued that that expansion of Jamshedpur town will be adversely affected by the ESZ notification. It again wrote to the ministry in January this year to reduce the ESZ to 500 metres, which was rejected on state’s recommendation. 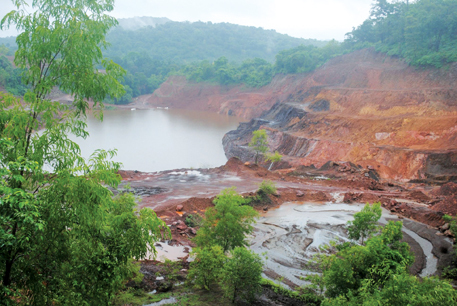 Goa has been opposing ESZs because most of its iron ore mines are concentrated near wildlife sanctuaries. As per a report by the Central Empowered Committee, an adviser to the Supreme Court on forest-related issues, at least 162 mining leases in the state were granted within 10 kilometers of PAs. While at least 19 mines operated illegally inside the sanctuaries, most of the other mines were operating in violation of environmental norms. As a result, the Supreme Court imposed an indefinite ban on mining in Goa last year and slammed the state for not notifying ESZs around PAs. Goa finally formulated the ESZ proposals, but made them in such a way that mining activities are not affected in the future.In a bid to bring the least area under ESZs, the Goa government said that “natural boundaries” of PAs, which are defined by the hills, rivers or plateaus, should be considered for defining ESZs. In most of the cases, the natural boundary of a PA is nearly the same as the actual boundary of the PA. An expert committee of the environment ministry, however, found wildlife presence in up to three kilometres from the actual boundary of most PAs, and recommended that the ESZ should be at least 1 km from the PA. In Madhya Pradesh, the state government has conveniently fixed ESZ boundaries in most PAs at two kilometres. For Satpura national park in Hoshangabad district, the forest department had proposed that five kilometres around the boundary be notified as ESZ, but it was reduced to two kilometres on state Cabinet’s instructions. “The environment ministry had asked for identifying site-specific ESZs. It seems the Madhya Pradesh government had arbitrarily decided that no ESZ will be more than two kilometers. Where are the ecological criteria in this?” asks Ajay Dubey of Bhopal-based non-profit Prayatna. A high-ranking official in the environment ministry admits that most ESZ proposals sent by states are flawed. “States like Tamil Nadu, Andhra Pradesh, Jharkhand and Goa kept the mining areas out of ESZs, irrespective of their ecological value. Besides, no ground investigation has been done in most proposals. The areas are randomly marked on topographic sheets,” says he. In an internal meeting of the environment ministry in May this year, its wildlife division had expressed concerns over the quality of the state ESZ proposals. “Most proposals do not follow ecological aspects of the objective of this exercise,” says the division’s note sent to the director general of forests before the meeting. The note points out that in most of the proposals, distance from the PA boundary was made the only criterion for defining ESZ and factors such as habitat connectivity and ecological integrity of the region were rarely considered for identifying the zones. The Supreme Court had ordered in 2006 that till states do not notify ESZs, all projects within 10 km of a PA will require an approval from the National Board of Wildlife (NBWL). Under ESZ, commercial mining, polluting industries and large hydro-power projects are prohibited as per the ministry guidelines. States might, therefore, be reluctant to notify ESZs and prefer NBWL clearances for projects near PAs. Wildlife activists are worried. “With the increasing pressure on land, ESZs are imperative to maintain the integrity of our already fragmented PAs. ESZs must be identified judiciously after taking into account crucial wildlife corridors. The worry is that considerations other than ecological are dictating ESZs,” says Prerna Bindra, former member of the standing committee of NBWL. The environment ministry guidelines for identifying ESZs are also being blamed. “There were no criteria defined for including or excluding an area in the ESZ, leaving it to the forest officials to arbitrarily take decisions,” says a forest official in Uttarakhand. With tremendous shortage of manpower, the environment ministry may not be able to crosscheck the proposals on the ground and rectify their flaws. “The Wildlife Institute of India is scrutinising the proposals. If they have an issue with any of the proposals, we send it back to the states with comments. After the states respond, we forward them for draft notification,” says S S Garbyal, Additional Director General of Forests (Wildlife). Communities living around PAs in several states have protested against ESZs in the past 10 months. Though ESZ does not affect the ownership rights of people on land resources, it restricts land-use change. Activities such as widening of roads, construction or expansion of buildings, change of the agriculture system and erection of electric cables will also be regulated by a monitoring committee, mostly comprising of government officials, as per the master plan of the ESZ. Tribal rights activists demand local participation and incentives to the community for implementing ESZ. “The monitoring committee in the ESZ is not democratic. Only a handful of officials will take all the decisions. People will be at their mercy for every permission,” says C R Bijoy of forest rights forum Campaign for Survival and Dignity. He argues gram sabha should be the monitoring authority in ESZ. “Most ESZ areas fall on revenue land. If people can’t use their land according to their will, they will protest. The Centre should come up with a plan to incentivise farmers for sticking to green practices in ESZs,” M D Madhusudan of Nature Conservation Foundation says.